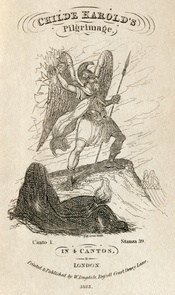 Byron's poem, "Childe Harold's Pilgrimage"
In Byron's poem, "Childe Harold's Pilgrimage" the main character is portrayed as a dark brooding man, who doesn't like society and wants to escape from the world because of his discontent with it. Through the poem we see the strong resemblance the Byronic hero has to many of todays popular characters, such as Batman. In the third stanza of the poem we learn that Childe Harold is the product of a long line of nobility. "Childe Harold, was he hight-but whence his name and lineage long." Bruce Wayne who is Batman is too the product of an extremely wealthy family. As with Bruce Wayne, Childe Harold is bothered by his family ties. "But one sad lose ruins the name for ay." This line shows that Childe Harold is upset with the reputation that he has inherited from his family. Just as Bruce Wayne d ÃÂoes Childe Harold strives to break this mold and become someone who isn't associated with the likes of his ancestors. In Childe Harold's case he breaks this mold by running away from his father's castle and exploring nature. Bruce Wayne on the other hand invents himself a new identity that differs in every way from the preset mold into which he was born. WriteWork contributors. "Byron's poem, "Childe Harold's Pilgrimage"" WriteWork.com. WriteWork.com, 30 November, 1996. Web. 20 Apr. 2019. Lord Byron's views regarding nature and society in "Childe Harold's Pilgrimage"
Sir Lord Byron's use of the byronic hero.